While Google acknowledges there are important and ascending areas of web usage – video, social and mobile – none will produce anything close to the revenue and profits for Google like search has. 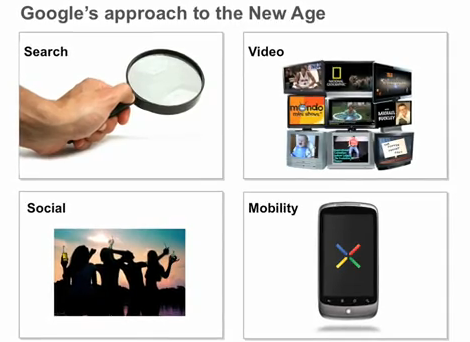 The following video is a “fireside chat” with Google CEO Eric Schmidt. The following are excerpts from Eric Schmidt’s commencement address at Carnegie Mellon’s 112th commencement ceremony, held May 17, 2009. You cannot plan innovation. You cannot plan invention. All you can do is try very hard to be at the right place and be ready. How should you behave? Well, do things in a group. Don’t do things by yourself. Groups are stronger, groups are faster. None of us is as smart as all of us. I wonder what Thomas Edison would think about Mr. Schmidt’s comments above? Today’s Saturday Interview in the New Yorks Times was with Google CEO Eric Schmidt. Businesses who haven’t yet concluded measurable advertising is better than unmeasured advertising fall into three categories. In a future post, I will describe my experiences explaining search advertising to each type.